"Polka-dot granite" is a distinctive rock, which has been found at several localities in Southern California. 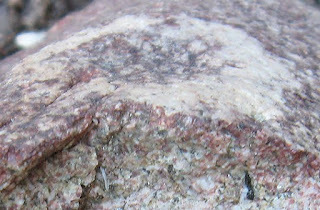 It has been used to indicate offset along the San Andreas Fault system, but some geologists have reported that this distinctive granite might not all have been derived from the same magmatic source. More geochemical research is needed. 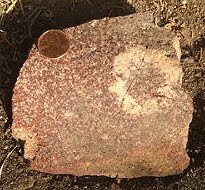 “Polka-dot granite” is a granite with clots of cordierite (a mineral containing magnesium), biotite, garnet, and other minerals surrounded by an irregular halo (absorption sphere) consisting of white granite with little or no mafic (dark) minerals. The inner and outer margins of the halo are irregular but distinct. The halo is surrounded by the same granite that occurs in the center of the halo. The result looks like large polka-dots, which range in diameter from less than a centimeter to 8 cm. "Polka-dot granite" collected from Southern California by Dave Liggett. Same specimen shown above but photographed in the shade. "Polka dot" is 4.4 cm in diameter. Another "polka dot" (1.5 cm diameter) from the same locality. By the way, cordierite is known for its ability to withstand extreme temperatures. It is used for making "pizza stones" because you can take the stone from a low temperature to a very high temperature without the risk of breaking it.